Ed Wallace, co-chair of the New York City office of global law firm Greenberg Traurig, LLP was named to City & State’s 2019 “NYC Power 100” list. Greenberg Traurig's Ed Wallace was named to City & State’s 2019 “NYC Power 100” list. 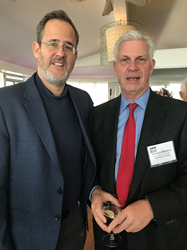 Ed Wallace, co-chair of the New York City office of global law firm Greenberg Traurig, LLP was named to City & State’s 2019 “NYC Power 100” list. Earlier this year, the publication also ranked Wallace number 12 on its Manhattan Power 50 list. The New York City Power 100 list honors the 100 most influential people in government, business, culture, and social services. In 1981, Wallace became the then youngest City Council member in New York City history representing the Borough of Manhattan. Wallace began his career in the Chelsea neighborhood office of the Legal Aid Society. He also served as chief of staff to City Council President Carol Bellamy and later as vice president for finance at Mort Zuckerman’s Boston Properties. From 2012-2014, Wallace was chair of New Yorkers for Parks and now sits on the NY4P Board. Wallace serves as vice chair and counsel to the Citizens Budget Commission and is the vice chair of the French American Foundation Board. Professionally he has been listed in multiple editions of The Best Lawyers in America and Super Lawyers, and is rated AV Preeminent® by Martindale-Hubbell. Wallace serves as a trusted advisor to his clients. He has represented Columbia University, NYU, and Fordham University in their Manhattan expansions. He has advised Extell, Silverstein, Fetner Properties, and other leading developers and financial and media companies in obtaining government approvals. Wallace also advises Hornblower, the City’s ferry provider, and serves as outside national counsel to JCDecaux, the world’s largest street furniture company. About Greenberg Traurig’s New York Government Law & Policy Practice Greenberg Traurig has one of New York City’s leading real estate, land use, and government relations offices in the City. The Government Law & Policy group, which has been consistently ranked among the Top 5 lobbying practices in New York City by the City Clerk’s Office, represents major U.S. companies, leading not-for-profit institutions and major real estate companies in major transactions involving New York City. The attorneys are part of a national practice named “Law Firm of the Year” in the U.S. News-Best Lawyers 2014 edition of “Best Law Firms” for Government Relations.